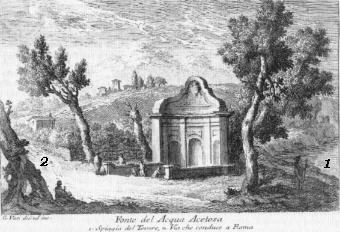 The plate shows the fountain built in 1661 under Alexander VII and it is attributed to Gian Lorenzo Bernini, although based on documentation it is more likely the only architectural work of the painter Andrea Sacchi. 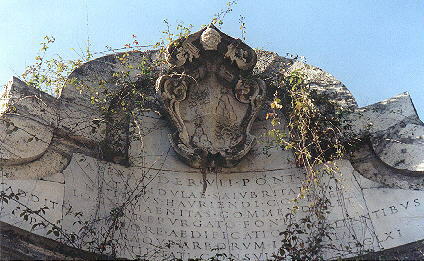 It lies some 3 miles North of Porta del Popolo close to the river banks. In the description below the plate Vasi made reference to: 1) Beach on the Tiber; 2) Street leading to Rome. 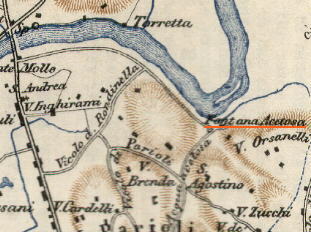 The small 1920 map shows the site of Acqua Acetosa. 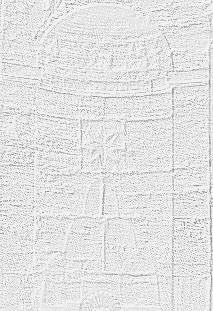 What was a far location well outside the walls, is now close to busy roads. Nevertheless it still stands isolated. 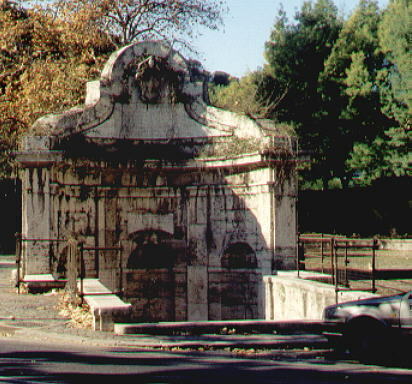 The shape itself of the fountain reminds of the mountains of Pope Alexander VII. The coat of arms is introduced by a large curved inscription which leads the eye to it. 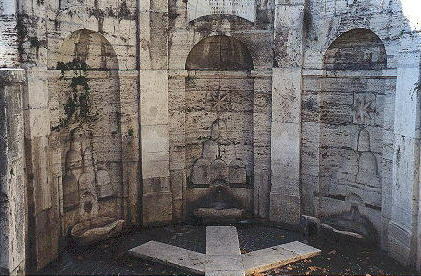 As on many other occasions Alexander VII wanted to ensure his posterity by having the monument itself decorated with his heraldic symbols. Aceto means vinegar. Acetosa is the derived adjective. Thus this water had a special taste and was kept in high esteem. 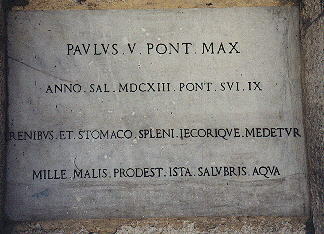 Its use was mainly for diseases of the stomach and loins, but as Paulus V plaque states "Mille(a thousand) Malis(diseases) Prodest(is useful for) Ista(this) Salubris(saluber) Aqua(water)".